Romance, Beauty, love and all things pretty. I have wanted to do a Valentine Themed photoshoot for some time. My creative partner, Genna Yussman Greene suggested we do one at the beginning of 2017. Genna had put together some vintage dressers and I wanted to do some classy updos and polished hair. We enlisted our buddy, Isidro Valencia for make up and two gorgeous models and our team was set. We wanted to fuse romance, with big hair and vintage styling for a timeless feel. Genna ordered a custom floral backdrop to be used for the shoot. We chose two gorgeous models, Emily and Kristina. We have worked with both before and chose both girls for their beautiful facial structures, Their tall lean looks and their positive attitudes on set. This collection was release exclusively by Bangstyle as a featured collection. The staff at Bangstyle have been so supportive of the work we do and they said the timing for the release was perfect. 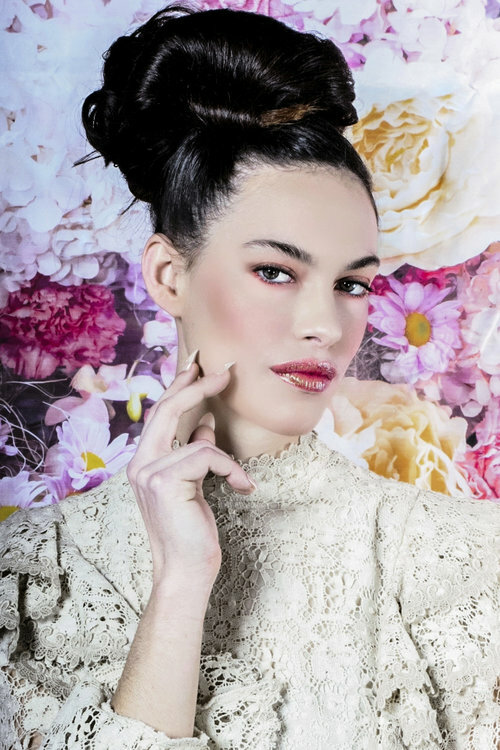 For Make up Isidro created a soft look consisting of soft smoky eyes, pink pastels color on eyes, shimmer, rosy cheeks and soft contoured cheeks. For This undo I converged all of Kristina's hair upwards into a ponytail I then added a long hair pad and a large wefted hair extension and form the hair over the pad into the shape using Fashion Works 12 and a finishing brush from Tearsheet. Control Addict 28 was used to finalize the look. For this Fishtail undo, I fishtailed braided random sections on Emily's entire head then with the ends pinned them between the sections created for the fishtails. This updo was a lot of fun. I was watching a lot of the old "Dynasty" so I did this timeless, voluminous undo with Redken's Guts 10 for volume. Next hair was pulled upwards into a couple of ponytails. A small hair pad was used for the bump on top that hair was covered with Emily's hair using Fashion Works 12. I smoothed the hair using a small finishing brush. The other ponytails that hair was backcombed, smoothed and rolled into shape with bobbie pins. Finished with Control Addict 28 and Shine Flash 03. The vintage look was set using Iron Shape 11 and Sam Villa's marcel iron and pinned to cool. Afterwards the hair was brushed out using Tearsheet's static free large tail comb and Fashion Works 12. No bend clips were placed in the hair to set it while Isidro finished Emily's her make up application. Kristina's hair was set in the same fashion with Emily's only different placement and finished with Control Addict 28.